Seventeen years ago, in 1998, a special tree planting ceremony took place for the grand opening celebration of Riverbend Elementary. Mr. Charles Boyd and his Tuscola High School landscaping class planted over 100 shrubs on the bank in front of the school. They skillfully spelled out Riverbend. This “special planting for the future” project was the result of a community effort through shrub donations and the generosity of Mr. Boyd and his class. The shrubs have become a landmark and have been admired for years by those attending and working at Riverbend and those traveling Highway 209 for almost two decades. The shrubs have been lovingly cared for and appreciated, but they have reached their life span. As the parents, administration and faculty with a limited budget were brainstorming how to carry on the tradition of the shrubs, we were notified that we were the recipients of the Lowe’s Hero Project. We all cheered as we were told that Lowe’s and their dedicated employees would take on the planting of new Riverbend bushes. As a school, we are so thankful to all those that contributed to the project in 1998, and so thankful to Lowe’s for helping us solve a problem. 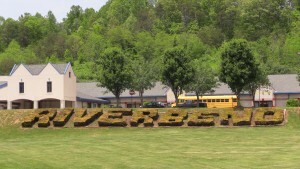 The RIVERBEND shrub tradition can now carry on for many more years to come. As you drive by our beautiful little school and notice our RIVERBEND letters, please think of all the people and love that came together to make the project happen.